I’ve been reading a book a day this week to start chipping away at my queue. 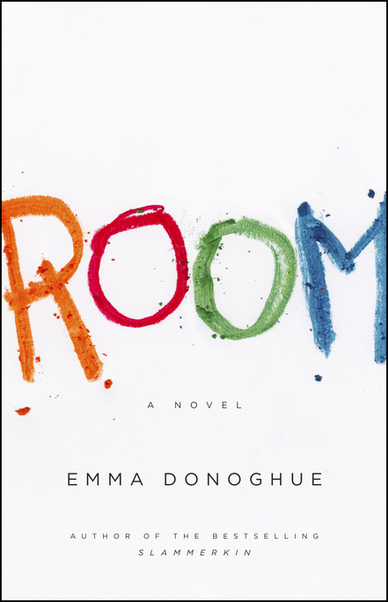 Room, by Emma Donoghue, was next and there are two things you should know before reading: 1) It is written from the perspective of a five year old; 2) The woman (Ma) is being held in the room as a sexual prisoner. I mention the first caveat because the incessant voice of a five year old can become tiresome long before the 321st page; the second, because this is understandably a disturbing issue for some readers and something you should know before going in. Also, block out a nice chunk of time—it’s a fast read and difficult to put down. Jack makes proper nouns of the room’s contents. I know a lot of people listen to audio books, but I doubt this effect would come off well through listening. Saying “Maybe Door makes him up” sounds like bad English until you see it in print and realize that “Door” is essentially a name. Jack has no one except his mother and tends to personify whatever is around, even assigning genders to the room’s contents. At times, his narration is clever and funny; but when he is feeling whiny or petulant, his voice becomes one of the most irksome ever penned. It’s a trade-off. The biggest drawback to this perspective is that the reader begins to crave a more adult perspective to explain the situation and flesh out characters. By the end, Ma’s development is more interesting than Jack’s, but the reader is robbed of any real insight into her character because Jack does not understand the situation. Also, I have a peeve with some of the word choices in this book. (Yes, I’m aware this is a minor, minor peeve.) Jack still breastfeeds at the age of five. Since they’re confined to the room and not eating the best foods, this seems a practical decision on Ma’s part if only for the extra nutrition. BUT Jack refers to this as “getting some” and there is something really creepy about a little kid lifting up his ma’s shirt to “get some”. Is there not another phrase, idiom, etc. that could have been used? Jack uses proper names for anatomy so this euphemism feels out of place, especially when it’s a euphemism that usually refers to getting laid. This would have been less noticeable if it didn’t come up a few dozen times. There is an ‘escape’ scene and Ma and Jack are free. This happens around the midway point of the novel. I say this is a minor spoiler, because you had to know it would happen. At some point the people in the tiny room have got to start talking about escaping, right? So they do. And on the outside, Ma is quickly outpaced by Jack in adjusting to the new world. Jack is like a toddler learning everything for the first time and the doctors believe he will not remember much of their ordeal when he is older. As for Ma, she has to try and re-enter the world after being gone for seven years (she was kidnapped at the age of 19). While Jack is thrilled with [nearly] every new discovery and coping with separation anxiety from his mother, his mother’s condition seems much deeper and complex. The reader can’t help but feel immensely curious as to how she is doing, but Jack is only able to parrot snippets of his mother’s conversation with doctors or give subject lines for their sessions. This is the point at which he becomes a tiresome narrator: he is an impediment to character development. She raises an excellent point, but in context this scene doesn’t work. And not just because of Donoghue’s interview. The reason the whole interview scene rings false is that the interviewer (the puffy-hair woman) doesn’t ever ask follow-ups. She says “Wonderful” etc., and changes the subject after each of Ma’s answers. It doesn’t feel like an actual interview of any purpose. UNTIL this moment comes along and the puffy-hair woman does ask a follow-up. It’s as though Donoghue is setting herself up to run with this point as she does in her own interviews. She has stopped writing a scene with convincing characters and clumsily dropped in herself. This would be okay, but this is the first and only time Ma talks about her ordeal with an adult where Jack is listening and not causing the conversation to be simplified. This scene seems like the one opportunity to see Ma as more than Jack’s preserver and entertainer, but it devolves into a public service announcement. Can’t it have been a bit of both? Overall: 3.3 out of 5. I’m really impressed by the consistency (to the point of irksome repetition) in Jack’s narration. Jack was superbly written, but no one else was. Translation: Read it if you have the time, but don’t feel encouraged to bump it to the top of your queue.